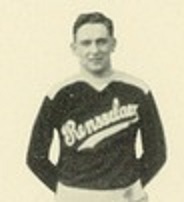 Paul “Dutch” Eschholz was the greatest athlete in the history of Rensselaer Polytechnic Institute. He won eleven varsity letters while participating in four sports: football, basketball, baseball and tennis. During his junior and senior years, he captained both the football and basketball teams. Paul Arthur Eschholz Born: Dec 1, 1904 Died: Oct 16, 1961 Hometown: Hartford, Ct.